Several years ago a friend told me about a camp in California, where his daughter was working for the summer. He contacted me because he was excited to tell me that they devote an entire week to Prader Willi Syndrome. Knowing it was a pipe-dream to think I could get myself and Katie to California, I hit the internet instead. A year ago I found Wonderland, Wonderland Camp in Rocky Mount, Missouri. Week long camps for people with “special needs” are held throughout the summer, but one week is specifically for people with Prader-Willi Syndrome. I was so excited. I signed her up for camp and researched nearby resort options for me. My goal was to find an affordable room at a place with a decent pool. 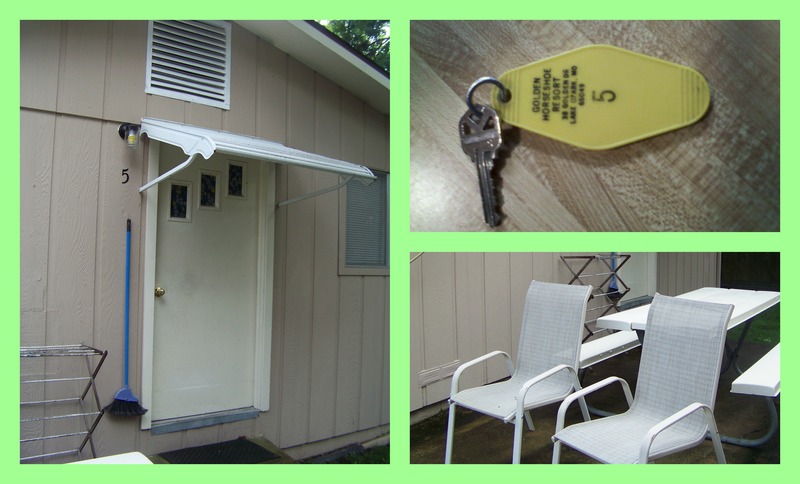 I made price the first priority and found a place with a decent price and pool, but realized that my room would be located above the resort bar and that the large resort had continuous activities planned, it sort of reminded me of a KOA campground only with buildings instead of campsites. I was looking for a much more peaceful, serene environment, like a state park campground; my main goal was to pamper myself, swim, and sleep. I found another place that looked like it would fit my requirements, when I spoke with the proprietor she confirmed that if I wanted a lot of activity I was looking at the wrong resort, I immediately booked my reservation. It was a wonderfully relaxing five days. I slept. I swam. I got rejuvenated. I vowed to do this every year. This year I made Katie’s camp reservation and called my resort. They booked me in the same room and I sent my deposit. I started selling scarves, jewelry, and cards to provide the means of getting us to Missouri. We saved our Christmas and birthday monetary gifts and, with the help of family and friends, we scraped together enough to cover her week and mine. For those of you new to our life, you need to know that PWS is a condition that requires diligent twenty-four hour supervision and monitoring of food, as people with it are constantly ….that means, ALWAYS and FOREVER hungry. This is why the camp has them come on a seperate week, so they can cater to the specific dietary restrictions that are necessary. This is also why….. I need a break! One would think that with constantly dealing with what to eat when, that food would be the furthest thing from my mind when I am not with Katie. I thought that would be the case, and was surprised when I realized that it is so ingrained in my being that before the trip I thought, “Where are the grocery stores? What should be my menu for the week? What staples should I take with me?” I told myself to stop thinking about the food, it was going to be irrelevant for an entire week. I could eat whenever I chose. I could…..gracious sakes!! !…… skip a meal if I wanted! I could have breakfast at 4:30am (yeah, like that would ever happen!) and lunch at 2 pm without anyone noticing the time span. I could have a sandwich and call that a meal without adding cucumbers, tomatoes, peppers, onions, radishes, and every other conceivable vegetable known to man. So, what do I do? I still think about food. My first blog post about my vacation could have described the serenity of no obligations, the peacefulness of no responsibilities, the wonder and majesty of a lake made by damning a couple of rivers……but, no. Staying true to myself, it is about food. Some of my food interest is not related to Katie, some of it comes from my ancestry of German farmers who still battle over who makes the best German Potato Salad at a picnic. The correct answer is, “mine”. It doesn’t matter who you are talking to, if they made German Potato Salad and you asked if they tried the others and whose was the best, the answer will be, “mine”. Just to clarify, I must tell you that mine is the best! As a young mother I canned fruits, tomatoes and homemade jams until PWS entered our lives and I didn’t know how to make those sugar-free. I think it is a benefit that I am passionate about food, cooking, and learning new things. That passion has helped make me adventurous in the kitchen so I could create interesting low calorie, low fat, low carb, high volume meals. The unfortunate part about my food passion is that I like to eat it all. I have a distinct memory of being told what Prader-Willi Syndrome was. In that moment I thought, ” it is such a bizarre condition that I doubt people will believe it is real when I tell them about it, they will think I made it up as an excuse for obesity”. At that time I weighed probably 140 pounds or less but decided then that I would not let myself gain weight, because I didn’t want people to think that Katie was obese because her mother is and it is simply our lifestyle choice. It grieves me that I was not diligent about that. There are far too many psychological theories that factor into my obesity for me to bore you with that line of thought, but I am glad that PWS is getting more awareness which makes me sound less of a looney tune and more legitimate than I sounded in her early years. My legitimacy is certainly not the main reason I am happy about the awareness, merely a by-product. I dropped Katie and the twins off at camp, checked into my room and went grocery shopping, I went to two stores so that I could find the kind of coffee I was looking for. I stocked my fridge and have eaten without regard to a clock. What would be in your fridge if you could eat whatever you choose? Yes, that is a lot of cheese, but it was a good sale, I can take it home. The margaritas are in there because I was anticipating a guest, I thoroughly enjoy margaritas, but the tequila puts me immediately to sleep…….or makes my clothes fall off…..or both! I am greedy and have not shared my lovely meal, the critters are not happy with this turn of events. Before me sat a cup of steaming Gevalia decaf with a touch of honey and cream; crunchy, seedy toast topped with Michelle‘s sweet red-raspberry jam; plump, chilly black grapes, and a piping hot omelette made with spinach, portobello mushrooms, vidalia onion, red pepper, bacon, ricotta and cheddar cheeses. I sat in my swimsuit and sarong, (because why would I wear anything other than that?) decided that I needed to scootch just a little bit in another direction to optimize my lake view…..scootching is NOT reccomended in plastic lawn chairs!! As I attempted this, two chair legs folded underneath and catapulted me off of the seat. Did you see “Identity Theif”? Remember the part where Melissa McCarthy gets hit by the car? She is hurled over the hood, against the windshield, onto the concrete and everyone thinks she is dead……yeah, that was me after being launched from the chair! I rolled, yes, actually rolled multiple times before landing sprawled on the deck with my sarong wrapped haphazardly around me. I untangled myself, gingerly arose to a sitting, then kneeling, then standing (only with the support of the nearby A/C unit) position. I hobbled over to pick up my upturned chair while thinking, “Oh, crud, I have to tell the proprietors that I broke their chair!”, as I upended it I realized it wasn’t broken, after all. I am currently seated in the wretched thing, the legs had merely folded under. My lumbar region is not happy about the incident, as I was already living on an injury from last week, but….on the bright side, the nearby squirrels were too busy chattering and giggling about my predicament to pilfer my food! I had all the car windows open and the radio blaring as I was approaching the Bagnell Dam Bridge. My hands began pounding the steering wheel as I shouted, yes, I SHOUTED, “omg! Omg! OMG! I’m here, I’m here, I’m HERE! Alone!” The fact that I was approaching the Bagnell Dam Bridge is probably totally irrelevant. I could have been approaching any place other than home and I would have had the same visceral excitement engulf me. I had just dropped my daughter and our two friends off at a camp in Missouri that devotes an entire week to people with Prader-Willi Syndrome. PWS is a condition which requires constant vigilance on the part of the responsible party in the household. Twenty-four hour supervision is needed with policing of any morsels of food in the house. Sure, the cabinets and refrigerator are locked, but for the brief moments that they are unlocked during meal preparation, items can quickly and stealthily go missing, so I sleep with an ear to the door listening for mid-night raids of hidden stashes of goodies. All this being told to you to explain my exuberance at having some much-needed and long overdue “me” time. As soon as the plan to take her to camp and to stay nearby for the week formulated in my head I began researching resorts on the Lake of the Ozarks. Price, of course, is always my most determining factor with second on the list being a decent swimming pool. Even though I would be on a lake I wanted a pool so I could swim laps. I had a resort picked out simply due to price and pool and thought it looked very wild which did not appeal to me. I was looking for serenity and restorative peace. I came upon a place that featured a nice looking rectangular pool at a reasonable rate, including a month of June discount, I phoned and spoke to the proprietress telling her that I had been reading other advertisements that showed lots of activities, bars, and restaurants all on site. She stated that if I was looking for that type of activity hers was not the place for me to stay. That statement cemented my decision that I had found the perfect resort at which to stay. I had an adorable little one bedroom unit with a kitchen. The balcony had a bistro table which overlooked the pool, docks and lake. 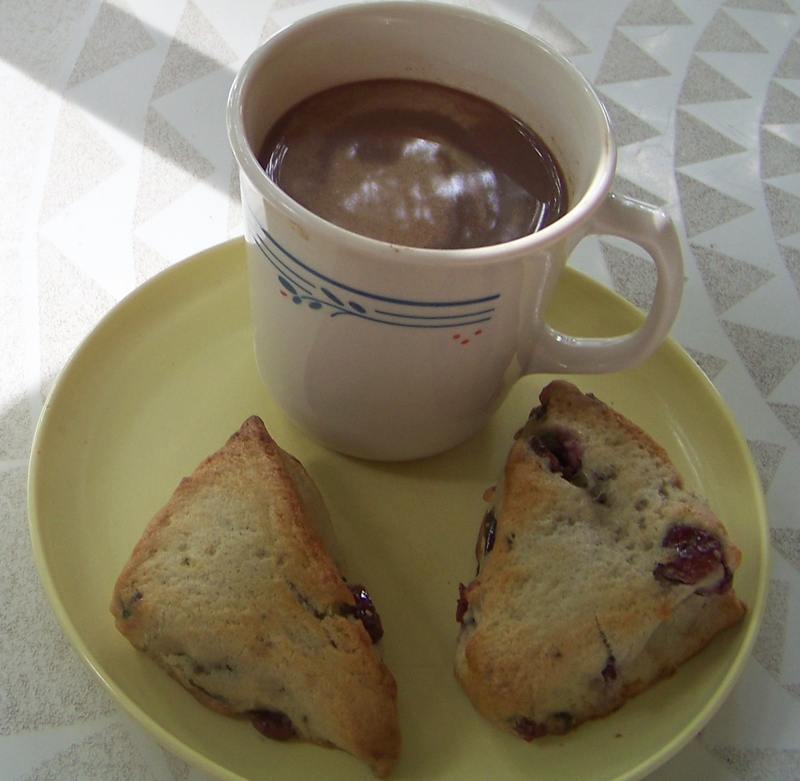 My first Ozark morning after a winter of not swimming laps,( just water ex classes) started in the pool (well, AFTER a cranberry scone and a cup of decaf Gevalia coffee turned into a mocha with the addition of cream and Russell Stover chocolate!) and am quite impressed with myself. thinking that was a decent workout, then followed it up with 1/2 hour of ai’ chi. 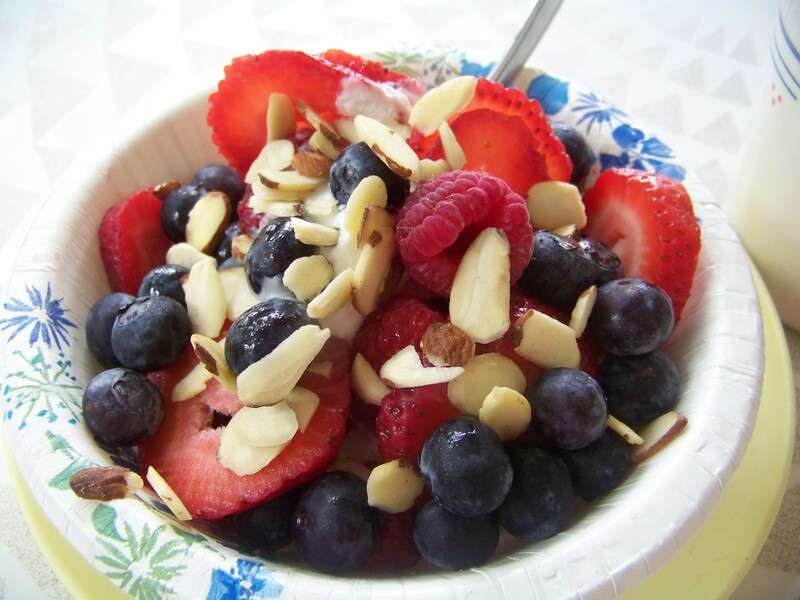 I returned to my balcony for breakfast round two, a bowl of luscious berries, almonds and creamy Greek yogurt. The proprietor walked by so I inquired about the length of the pool and found that it is 12 yards which means that 146 laps is a mile, my instinct had me at just 6 short of that, not bad. Anyway, my plan was to write this while eating breakfast round two, but my computer battery was dying, so I carried the laptop and camera inside. As I stepped inside, I received a phone call.I didn’t want to sit on any furniture in a wet suit so I shimmied out of it and just then realized I had forgotten breakfast round two on the balcony…..I knew I SHOULDN’T be naked to go out and get it, but was unable to get dressed without the use of both hands and my conversation was taking priority, so I left it for later. After we hung up, I threw on a long shirt and went out for my food….but a squirrel had beaten me to it!! 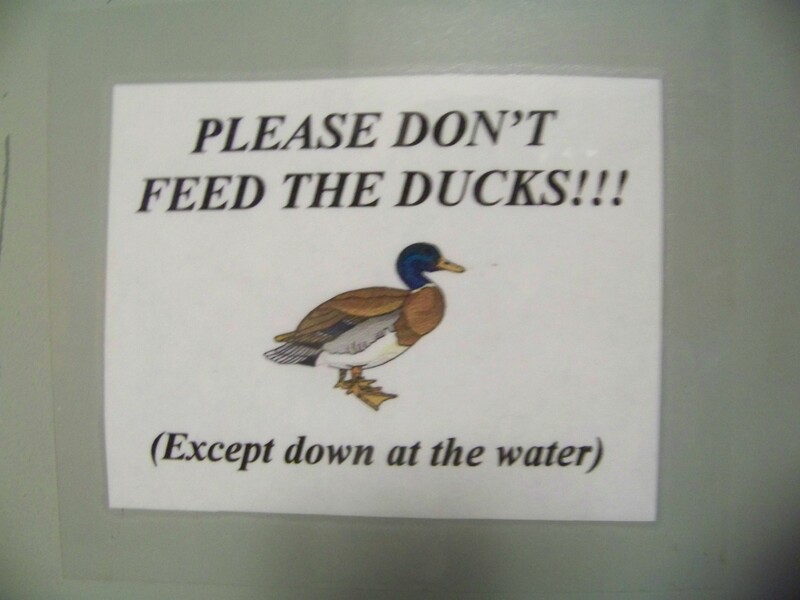 There is a sign on the inside of my unit door that says “Please don’t feed the ducks”, I think they targeted the wrong critter. If a squirrel eating my breakfast is the biggest stress of the day, I will happily feed him daily. Come back for more Ozark Observations. The pool is again beckoning.